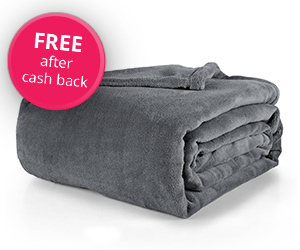 Unfortunately the "Free Fleece Blanket" offer is no longer available. 2. Once logged in, click the "Get Offer Now" button and you'll be directed to the Walmart website to make your purchase. Note: If you're on mobile, scroll down and click on "View Desktop Site" to see the cashback button. 3. Add one (1) Twin Size Mainstays Plush Blanket priced for $10.46 to your cart and checkout. Do not add anything else to your cart. 5. In about 14 days $11.19 will post in your TopCashback account. Offer valid through December 15, 2018.